Forever Metals hopes to make this important purchase as stress free as possible. 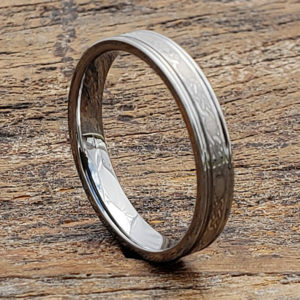 Our website has over 600 unique styles of rings for men and women. 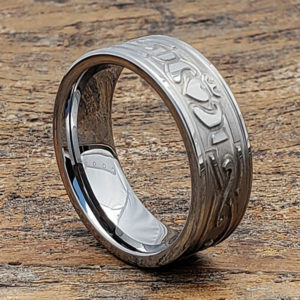 If you do not see what you are looking for please contact customer support to get custom quotes on your one of a kind ring style. In addition to the many style options your purchase is protected by a lifetime warranty. 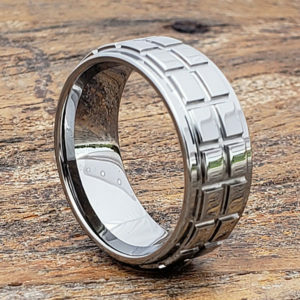 Why choose Tungsten Carbide Rings? Move over platinum and gold. 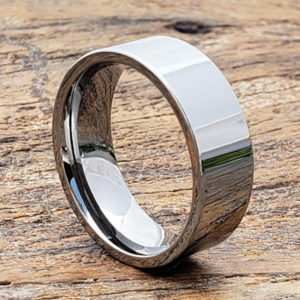 Tungsten rings are now a popular wedding band choice for men and women. The advantages of tungsten outweigh precious metal competitors by both strength and scratch resistance. 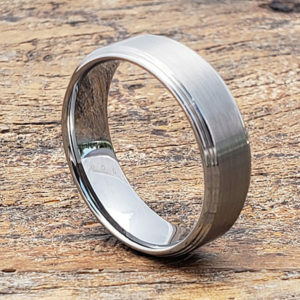 Tungsten wedding bands are ideal for those that want a ring to withstand the test of time. Please contact the Forever Metals sales staff with any further questions or concerns. Purchasing can be performed through our secure website or by phone. Check out our social media for potential coupon codes! 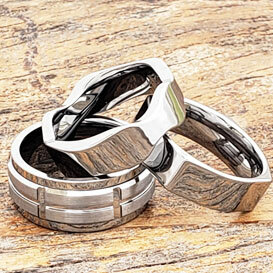 Tungsten bands are maintenance free. 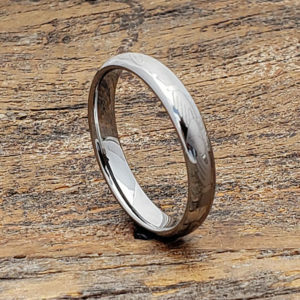 Normal everyday elements may leave your metal ring looking dirty. 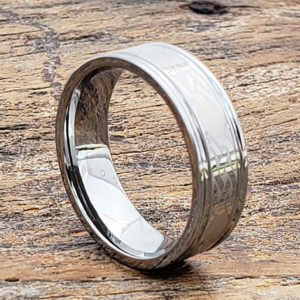 Simply wash your ring with soap and water to restore your ring to new condition. 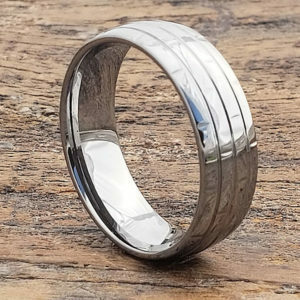 Do not use jewelry cleaners on tungsten or chemicals that could break down the surface of the metal. Please contact Customer Support if you have further questions in regards to cleaning. 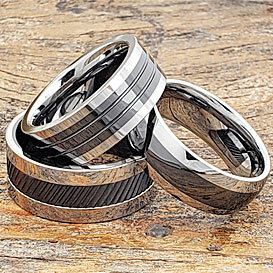 Read on how to care and maintenance your Tungsten Rings →. → Owner of the Forever Metals ™ brand since 2005. → Reached 13 years in business and still going strong. 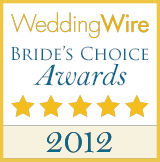 → Member of the Better Business Bureau since 2005 with perfect reviews. 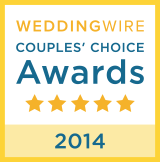 → Wedding Wire Customer Service Awards 2011, 2012, 2013, 2014. 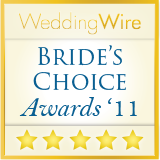 → The Knot Bridal Website and Magazine Best of Weddings Winner 2015 – Chicago. → Active in Social Media – follow us on Facebook, Twitter, Pinterest and Google+ for promotions. → United States Manufactured tungsten products. 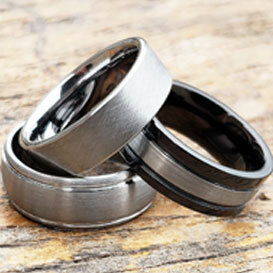 The past 13 years have proven that tungsten rings can stand the test of time compared to gold and platinum. 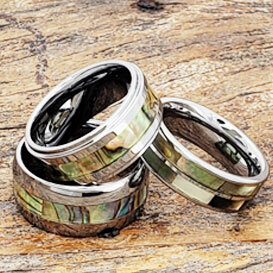 Tungsten is popular for not only a great price point but also for the many styles on the market. 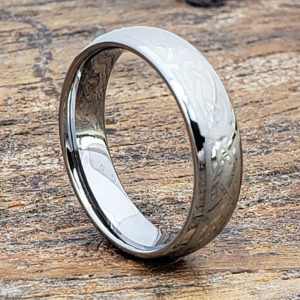 Below is a list of our best sellers and why we think you should try our rings on for size. 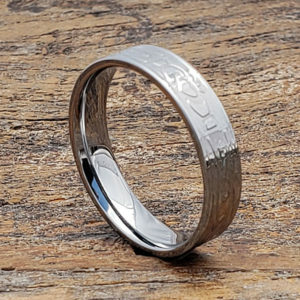 Whichever style you choose we promise to deliver the Forever Metals quality that has been serving couples for over 10 years. 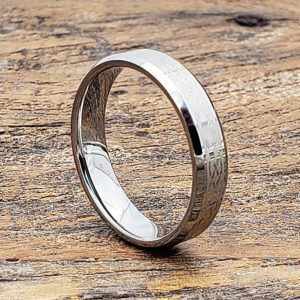 Forever Metals offers a Lifetime Warranty, easy exchanges and hassle free returns. 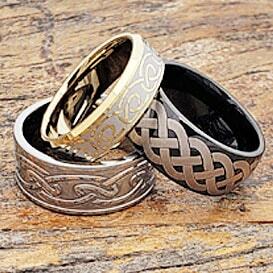 We also offer a lifetime trade in to "trade up" your rings for different styles over time. 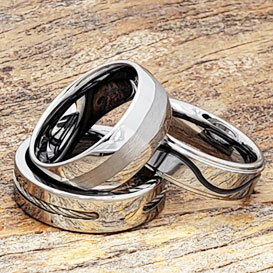 Thank you for choosing Forever Metals tungsten rings. 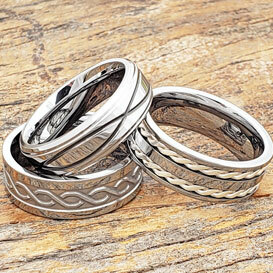 Forever Metals carries tungsten wedding bands for both men and women. Our online collection has over 600 styles with a blend of both classic and unique styles. 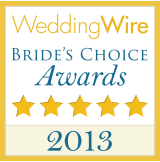 Below we have listed some of our bestselling categories. → The person wearing the ring is in a relationship with another person. 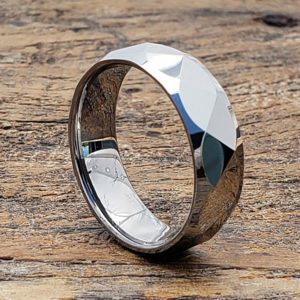 → The person wearing the ring is single. 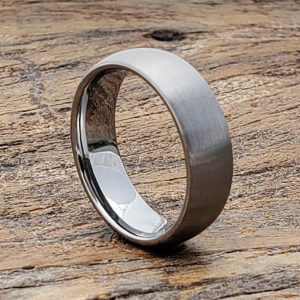 → The person wearing a ring in this manner is engaged to be married. 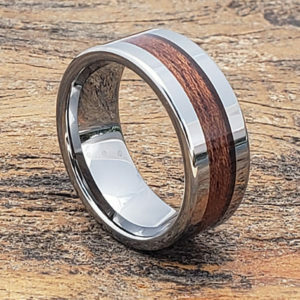 → The person wearing the ring is married. 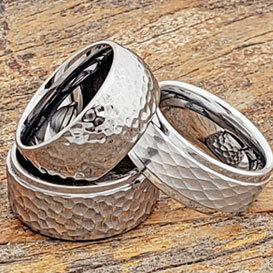 Look no further when choosing a ring with the person you love. 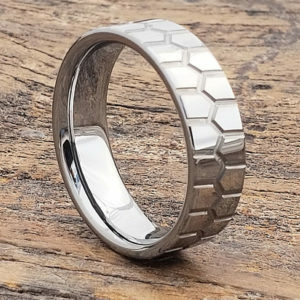 Forever Metals not only caters to men but women as well. Many of our styles will be available in widths as thin as 2mm to accommodate small hands. 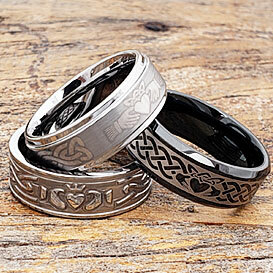 Our styles also come in unisex designs that make shopping for matching Claddagh tungsten wedding bands easy. 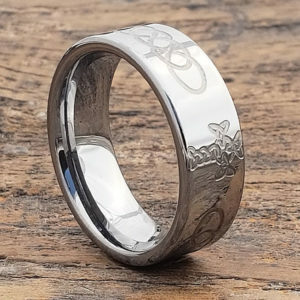 Plus, if what you are looking for is not carried in our online store we will be happy to customize. 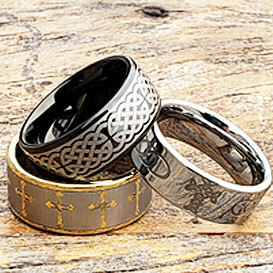 Some of our favorites for women include the Irish Claddagh rings and the stackable rings collection. 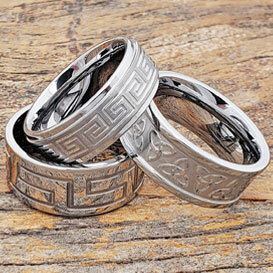 Within the stackable collection you can mix and match to find a ring that is fun and personal to you. 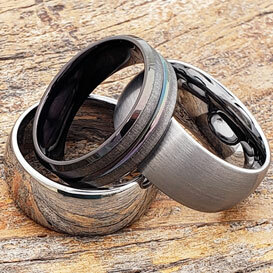 Black tungsten rings are a fashionable choice for those seeking a nontraditional ring. 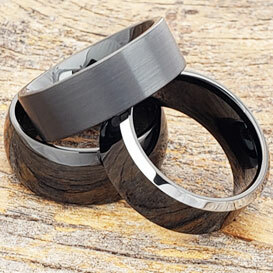 Please note that black tungsten rings are plated on the surface of a tungsten band so it must be handled with care for scratching could occur over time. 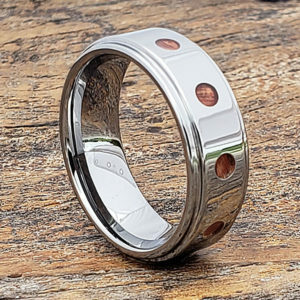 If this happens, Forever Metals will be happy to re-plate the ring for a small service fee. However, please do not let this deter your purchase. 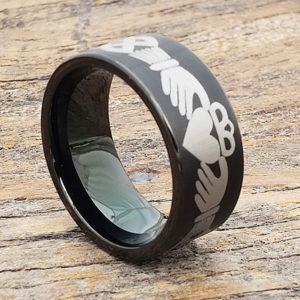 Black tungsten is beautiful and fun to wear. 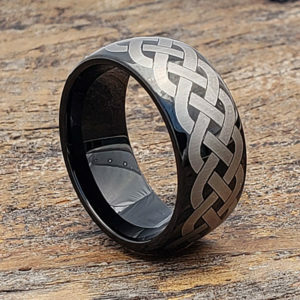 The black coating, although only plated, is incredibly durable. 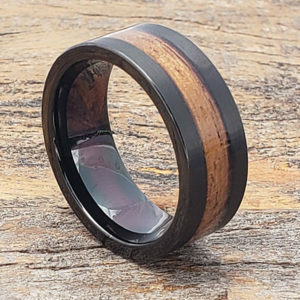 Normal every day wear will not scratch your ring. However trips to the gym with the steel bars or a hands on job can wear down the surface quicker. 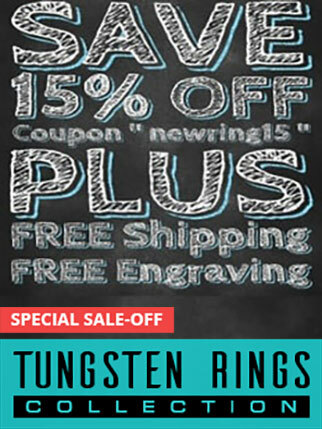 Being fairly new in the jewelry market carved tungsten is a great choice with styles built to last a lifetime. 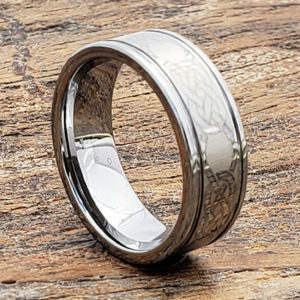 Popular carved style include Celtic knot work bands, carved personal messages and rugged designs including the best selling diamond plate tungsten ring. 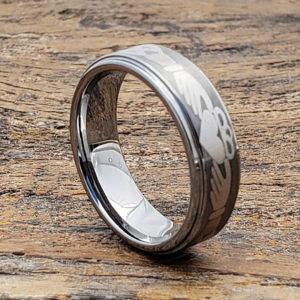 Laser engraved rings have an endless supply of styles due to being easily personalized to the wearer of the ring. 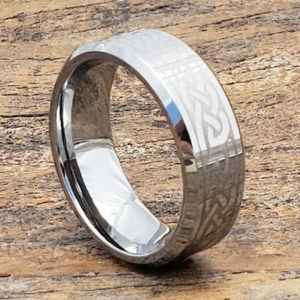 Forever Metals has a large collection of laser engraved rings including Celtic rings, knot work rings, classic wedding band designs and an affordable custom option to design you own ring. 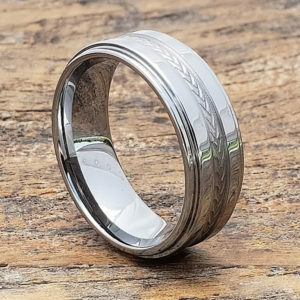 In addition to the many unique styles we have in stock, Forever Metals also makes sure to carry classic rings for those seeking a traditional wedding band to wear. For classic styling please take a look at our classic domed Eclipse ring coming in a sleek half round shape, comfort fit sizing and widths available from 2mm to 12mm. The Flat pipe cut Europa tungsten carbide rings are also popular as a simple wedding band choice in both a high polished finish and a satin brush for those seeking a slightly more subdued look. 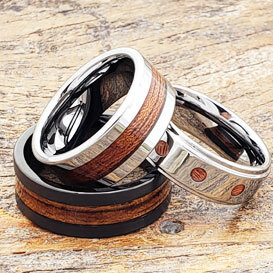 Colored tungsten rings consist of both black and gold colors plated onto a surface of a tungsten ring. 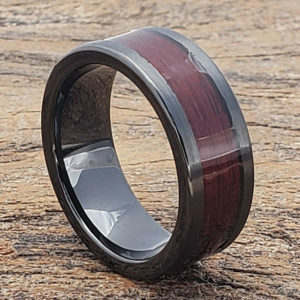 Choosing colored tungsten will allow you to wear your desired ring shade all while maintaining the durability of tungsten rings. 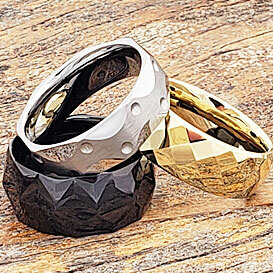 You will notice across our website that we have many black and gold plated rings in stock. 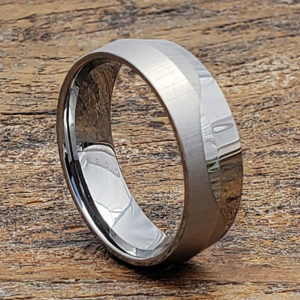 We can also custom order any ring in colored tungsten for a slight price increase. Please direct custom options to our sales team.